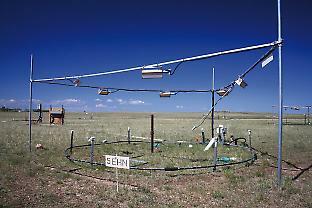 Controlled concentrations of CO2 are pumped into a 3-metre diameter plot that is also warmed by infrared heaters overhead. Feike Dijkstra is a Senior Lecturer in Biogeochemistry in the Faculty of Agriculture, Food and Natural Resources at the University of Sydney. He is a research collaborator of the Prairie Heating and CO2 Enrichment experiment in Wyoming, USA.